Who will be responsible for vetting the intellectual property of the content being shared? Are we just going to let the faculty deal with it? How do we want our university to be represented through open content? Is this just going to end up as a grab bag collection of the materials from faculty willing to share, or are we going to publish open materials more strategically to accomplish a larger end? How will this open publication intersect with other efforts to harness digital technologies to enhance the campus experience or build distance learning programs? How can it help? How can it hurt? How will we as a school communicate to internal and external constituencies about our open sharing approach? Not an exhaustive list, by any means, but some of the questions raised. Fortunately, the OCW Consortium has lots of resources to help schools develop their answers. At the recent OCWC conference in Boston, I had the pleasure of introducing the keynote, Tim O’Reilly of O’Reilly Media. During the introduction (in addition to inflating my educational resume) I mentioned that I wouldn’t have ended up at MIT OpenCourseWare if not for an O’Reilly book. 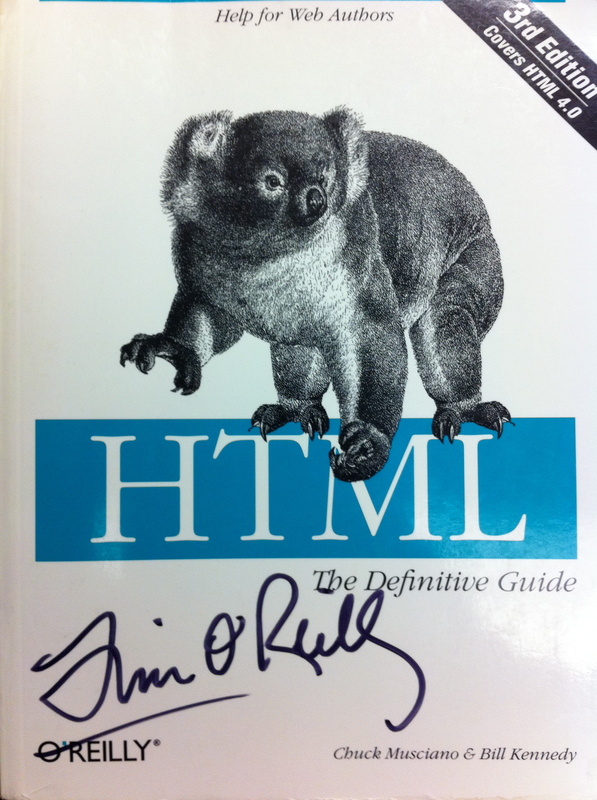 I shared how in the year 2000, I decided either this whole Internet thing was going to pass me by or I was going to have to do something about it, so I picked up an O’Reilly HTML book, and like millions of others at the time, taught myself to code web pages. This led to my creating a distance learning course, which led to much frustration over my school’s intellectual property policy, which led to an appreciation of MIT’s approach, and ultimately to a job at OCW. • Educational resources are, on balance, beneficial to those who have access to them. • Obtaining permission to publish under full copyright is as expensive as publishing under an open license. • The capacity open licenses provide for translation of OER into other languages, which has extended access to millions, is itself sufficient benefit to justify their use. “Open” is transforming how we think about education in the 21st century. Perhaps you’ve heard of “open eduction” and have wondered what it’s all about. What is it? Why is it important? What does it mean for you, your institution, your institution and the world? This course will help you understand the background, history and implications of open education. Open Education Practice and Potential is designed to introduce open education to a wide range of students from graduate students, to professionals and to teachers/faculty in K-12 and higher education. Class times: Thursdays beginning Jan. 27, 5:30-7:30 pm. Course tuition: noncredit and undergraduate credit $975, graduate credit $1,900. Open education builds upon the best traditions of educational innovation and the open source movement. It is a field that foresees remarkable transformations in institutions and teaching and learning at all levels. This course explores innovations in open education from a variety of perspectives. It examines the various dimensions of open education from traditional to contemporary. It explores the micro impacts—impacts at the course, curriculum, and program levels—as well as the macro impacts, those at the university and national educational policy levels. Finally, the course examines the remarkable transformative potential of open education on individuals and institutions. Open Education Practice and Potential will be graded on a number of individual and group projects throughout the term. The class culminates in a final project in which students develop an action plan for themselves or for their organizations describing how they will explore and implement open education principles. I do hope that OER will be able to generate some cost savings, and I see the best opportunities for this in open access journals and open text books. These would seem to offer savings opportunities, though, not because of their relationship to formal education, but because of their relationship to a media industry that is struggling to make its peace with the digital environment, and not doing a good job. OpenCourseWare is different (at least in the higher ed realm) in that there is no significant media industry out there making money on the sales of course content alone. Steve wrote persuasively that MIT OCW does not translate into cost savings, and that we probably shouldn’t look for cost savings in the OER context generally. In addition to the direct benefits of open licenses, they set (or continue) a community ethos that education is about sharing, and most of the universities that have come into the OCW movement have come in out of a commitment to the mission of disseminating knowledge. On a tactical level, the licenses are an important part of the “sell” to faculty considering participation. It’s an expression of the gift economy that educators have long participated in. So, open licenses help to grease the wheels and do add some benefits (in some cases quite significant ones), and I don’t see huge cost savings in eliminating them. David is covering territory I’ve written about for a while (reference vs. remix uses of OCW). Finger in the wind, I’d say open licenses contribute to about a quarter to a third of end user benefit (if you include translations and aggregations such as Videolectures.net in addition to individual uses of the licenses). I can kind of cope with it mentally when people not really involved in the space fail to differentiate between the benefits of (1) materials published on the public web and (2) open educational resources. But this conversation with Steve is a repeat of several conversations I’ve had lately. In many cases, people in-field can’t articulate a difference at all, which is disappointing but not depressing. In other cases, more articulate people clearly know the difference and seem to have rejected the necessity of open licenses. I believe open texts and open journals have the potential to save money because they supplant an entrenched and failing industry; I don’t see the cost savings in OCW, and it does a disservice to both adopters of the practice and the movement as a whole to sell OCW on those merits. I believe open licenses are an important part of OER both because they set a community standard of openness and because they allow for the materials to be modified and redistributed in ways that magnify the benefits of sharing the materials (in the case of MIT OCW, I’d say 1/3 to 1/4 of all benefits). Based on the data I’ve seen, I believe that the bulk of the benefits of open licenses come from macro-level activities such as translation and redistribution that permit reference-based non-remix micro uses rather than the micro level rip-mix-burn by individual educators, although we do see some of this occurring. I really feel like we are swinging from hyperbolic statement (If open education practitioners cannot move from large-scale sharing to large-scale adopting, the field is dead) to hyperbolic statement (if linking is adopting, every penny spent openly licensing has been wasted) with little connection to data. It’s quite possible that open licenses are very valuable even if only a small minority of users take advantage of them. These may either be users that can have widespread impact, such as translators and redistributors, or they may be young innovators who will change future practice down the road. But let’s move from what we observe to an understanding of how the field is generating such remarkable impact, rather than starting from a conceptual notion (individual faculty saving money through rip-mix-burn) and when it doesn’t appear in practice claiming the sky is falling. By the way, all the benefits listed in Table 4B of my previous post are benefits of open licenses, as they relate to faculty incorporating materials into their own courses. 1) The costs he describes as costs of openly licensing are actually the costs of licensing under any terms, including full copyright, and it wouldn’t cost any less to do full (C). 2) There are plenty of examples of how the CC licenses generate benefit, the largest (as I said in the post) was the translations that have made the OCW content available to huge non-English-speaking audiences. Lots of more granular examples exist, but are they the bulk of the use? No. I guess I’m also losing the point of the conversation here. I thought we were discussing whether cost savings were a compelling argument for doing OCW, but now we seem to be discussing whether there is an economic case for open licenses. There’s plenty to discuss in either case.